Felipa in Casillas. This—and other photographs in this piece—by Oscar Rodríguez, December 2016. 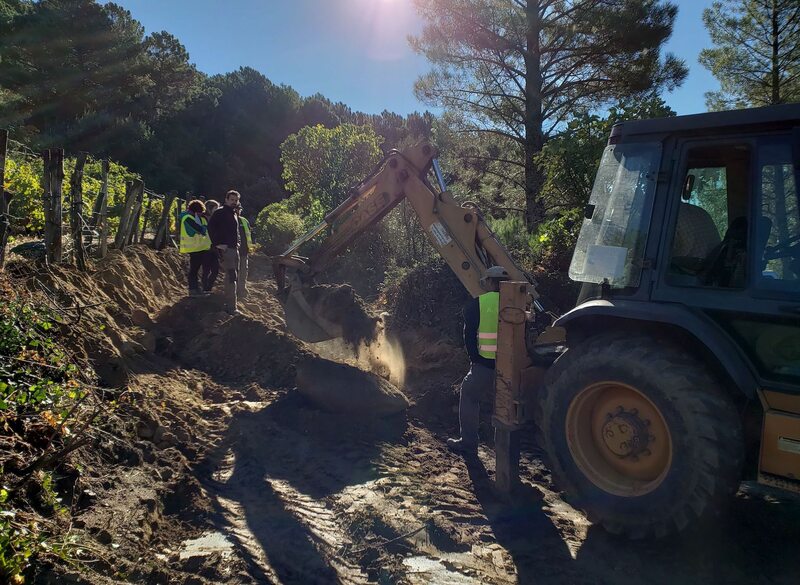 On a cold October morning last year, I stood in Casillas, a village in the forested hills outside of Madrid, and watched a truck methodically excavate a dirt footpath extending out from the road. A dozen people stood beside me, all of us gathered due to the efforts of one 88-year-old woman, Felipa Peinado. 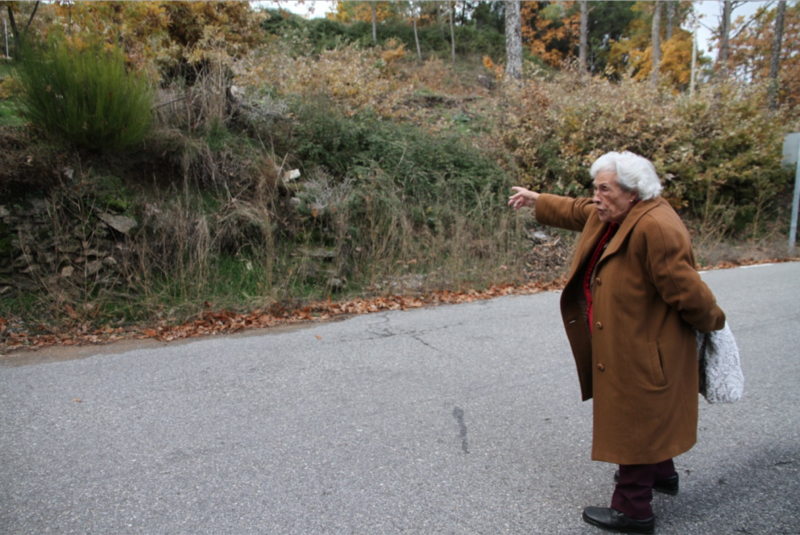 For almost twenty-five years, Felipa has been searching for the bodies of her family members and neighbors murdered in 1936, at the start of the Spanish Civil War. The current search was the third to take place in Casillas. Felipa is known here as la loca — “the crazy woman” — for her refusal to abandon the search and for her uncompromising condemnation of her former neighbors, some of whom are the children of her family’s murderers, for their unwillingness to help. Casillas is a small farming community in the province of Ávila; its historical roots date back to the fourteenth century. When Felipa was born here on January 1, 1930, there were almost 1,400 residents in the village. The population has dropped sharply since, to just 637 as of last year. 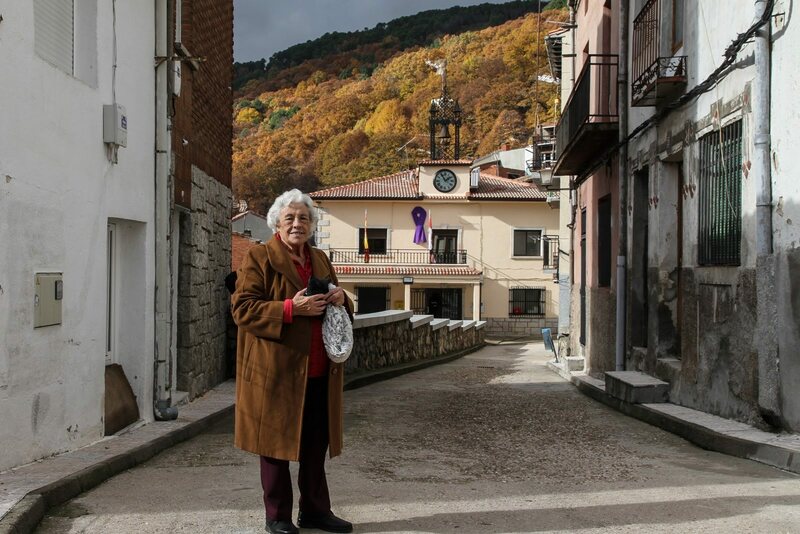 The Civil War broke out six years after Felipa’s birth, and Casillas, like many rural villages in Spain, was split between supporters of the Republican government and the fascist coup. Felipa’s father, Julio Peinado, was a pharmacist in the village at the time, and president of the seat of the local socialist party. He was 32 years old, and had been married to Felipa’s mother for six years when he was killed. Julio’s father, Santurnino Peinado, and his mother still lived in Casillas, as well as his uncle, Regino. Regino was a tall, elegant man with fashionable clothes and a sombrero. He had recently returned to Casillas after living in Buenos Aires for some time. His glamorous homecoming, however, was greeted with hostility in the village, in particular by the two head teachers, a staunchly fascist married couple. These teachers would later betray Regino and another nephew to fascist forces when their troops arrived in Casillas. The details of the murders are unclear. Felipa was only 6 years old at the time; other potential witnesses still refuse to talk. Details from those days come in snippets. On October 9, 1936, Felipa’s father was forced out of the family home. It was four in the afternoon, still full daylight. Along with four other villagers who supported of the Popular Front, Julio was brought to an area some two kilometers outside of the village and shot — not by fascist troops, but by his neighbors. These neighbors buried Julio and the four others on the side of the road in a cuneta, a ditch. In Spain, this word alone has come to evoke the thousands of extrajudicial killings during the Civil War. Felipa’s grandfather was shot a few days later. The murderers told his wife, Felipa’s grandmother, that Santurnino had gone off to France with another woman. Felipa continued to live in Casillas with her mother and siblings for several years, alongside her father’s murderers. The family would pass the site of her father’s execution every day as they walked to their farm, and Felipa grew accustomed to her mother’s daily refrain: No miréis, ni lloréis — “Don’t look, don’t cry.” The neighbors were watchful, and Felipa’s family would be in danger if they were seen to be in mourning. Felipa’s mother did not receive her widow’s pension, because her husband’s death was never recognized by authorities; Julio Peinado was listed only as desaparecido, disappeared. As soon as she could, Felipa left Casillas, taking up work in Madrid as a maid when she turned 14. 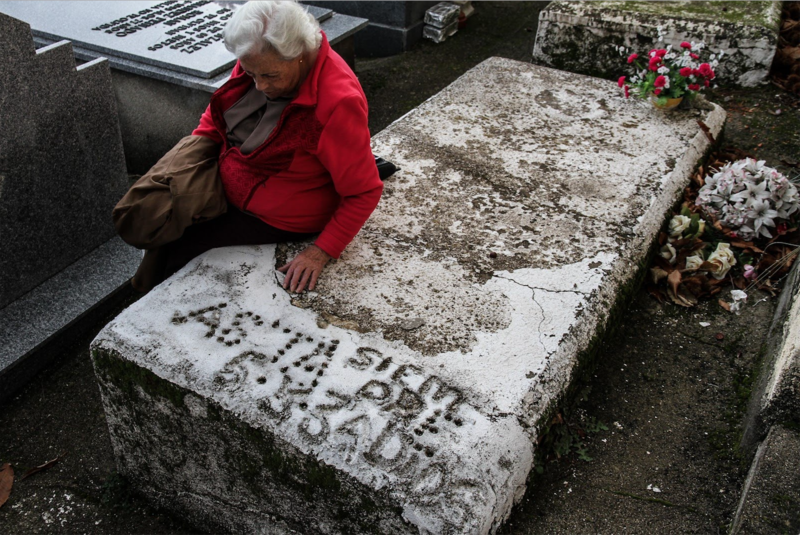 Sixty years after her father was killed, Felipa returned to the site of his murder. In 1996, the regional government was carrying out an expansion of the single-lane road into Casillas, and the construction was slated to pave over the area where her father’s body had been buried, likely destroying the grave. Felipa travelled from Madrid to protest the construction. She lay down on the road, in front of the excavator, and refused to move until the project was halted. In the early two-thousands, Felipa located the remains of her grandfather, as well as the bodies of two other victims. It is likely these belonged to two young men who had disappeared around the same time as Santurnino. They had last been seen disrespecting the Falange party by marching around the town wearing some fascist uniforms they had found. The three men had been buried at the entrance of the village cemetery, under a rock, with the effect that everyone who entered the area would walk over their graves. 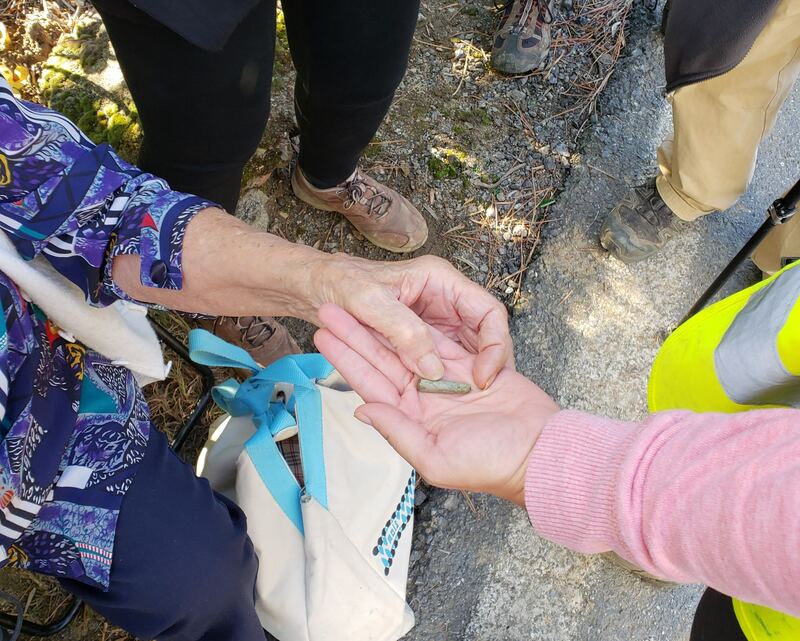 This search was organized by the Association for the Recuperation of Historical Memory, or ARMH in Spanish, one of the few organizations in Spain dedicated to documenting, identifying and exhuming the bodies of victims of the Civil War and Franco’s dictatorship. I had been invited to attend the search by a friend of mine who has worked with the ARMH for years. Since its founding in 2000, the ARMH has excavated more than 150 graves throughout Spain, recovering over 1,400 victims and returning them to their families. The task that remains is enormous. As recently as 2015, the ARMH estimated that 114,000 desaparecidos, in more than 2,300 mass graves around Spain, are yet to be found. The organization receives no federal funding, and relies on private donations, often from surprising sources. A significant portion of the funds come from labor unions around Europe, part of a tradition stemming from the International Brigades who joined the anarchist and Popular Front factions fighting fascism during the Civil War. Felipa’s search was funded in part by ELogIT, a Norwegian union of electricians who reached out to Felipa in 2016. There is an urgency to the ARMH’s mission. Many of the killings were not officially recorded, so the searches rely on local rumors and the memories of people who are now over 80 years old. Local and regional bureaucracies pose another problem, especially when politicians are not sympathetic to the ARMH’s work. The search effort in Casillas had obtained permission from the owner of the land, the town hall and the government of Castilla y León. They had not, however, been able to access the local town archives due to a ruling by an adversarial judge. The search thus depended entirely on locals’ word, with no ability to cross-check with any historical documentation. Throughout Spain, the fate of these searches similarly hinges on arbitrary, personal factors. In Casillas, for example, the efforts have been aided by the mayor of a nearby town who is a close childhood friend of Felipa’s. Without that connection, it is possible none of the searches would have taken place. 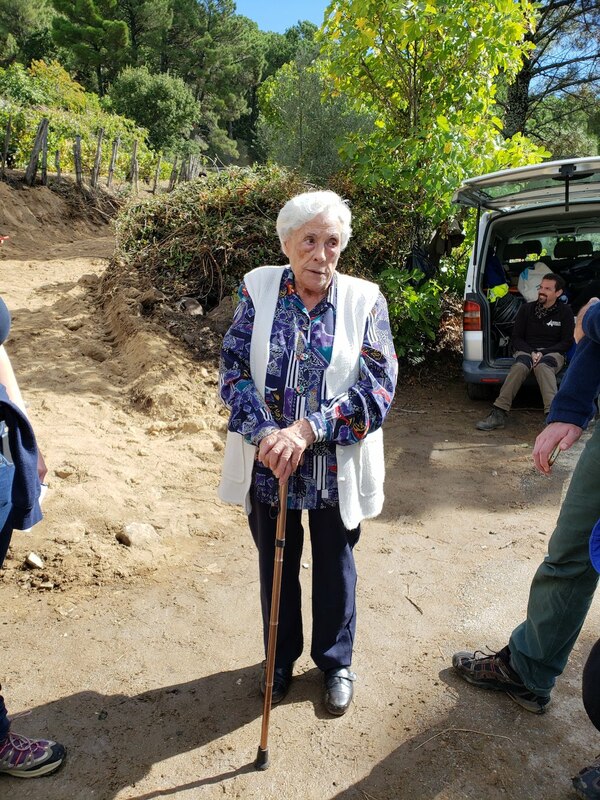 As we watch the excavator, Felipa tells us of a conversation she had following the 1996 exhumation, when one of her neighbors, Marcelino, asked for her forgiveness. Marcelino was a boy at the time of the murders; he was playing with his friends outside the village when Felipa’s father was forced up the road with the four others. Marcelino hid under a bridge while the executions took place nearby. When they were over, and the bodies buried, he gathered the bullet cartridges and built a cross over the cunetas. Marcelino had asked Felipa’s forgiveness because the victims, being communists, would have rejected religious affiliation. The search lasted for about a week. The bodies of Regino, his nephew and the third person were not found, although the ARMH’s metal detector unearthed a rusted bullet nearby. It’s likely that the fosas were destroyed during the road expansion in 1996. The former mayor of Casillas admits that some bones were found and moved during the construction. 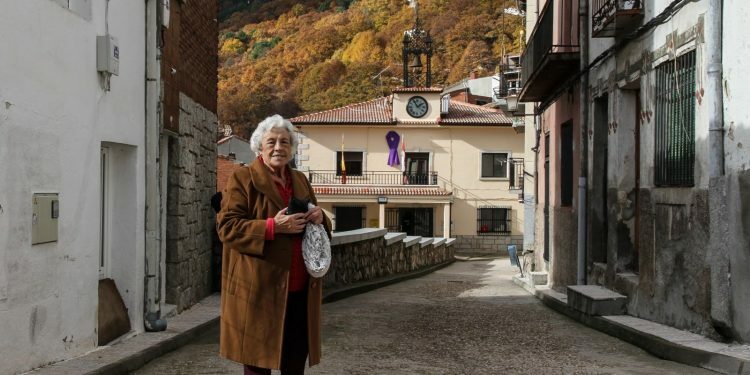 The many barriers to this search, including residents’ reservations, are indicative of the grip Franco and the legacy of fascism still have over Spanish society, and over older generations in particular. Anna Oakes lives in Madrid and works at the newspaper La Marea. She graduated in 2017 from Wesleyan University, where she studied sociology and Latin American studies.